In typical Aunt Donna Jo fashion, we had more than a feast for Thanksgiving! We got to their house just in time to watch the Macy's Thanksgiving Day parade (that they had taped so we didn't miss a minute!). After that started the food that didn't end all day! There was so much I am just not even sure I have a favorite. Table presents, advent calendars, lots of pies and all with family equals a great holiday. Lots to be thankful for again this year. Especially the love from all of our family and friends. Thank you! Yes you! Can it really be Thanksgiving time already??? This unseasonably warm weather is really fooling my sense of time. I not ready for the holidays,but I AM ready for some time off from work with family! Always a great time playing with Jakie and Joshie. We had a delish BBQ dinner, hit the playground, took a hike on the Appalachian Trail and acted silly with Uncle Kevin! I guess it is the start of the holiday season because tonight was the Trellis Lighting at Christopher Columbus park. A fun night with all of our friends, holiday music and lots of sweet treats. We have always loved our neighborhood events, but they are all more fun now that we have so many neighborhood friends. The blue trellis lights are gorgeous along the water, but the kids would not let me take their picture under them. Maybe next time! Who could pass up a hike on such a gorgeous day!! I have been loving all of this warm weather but I know it is going to end. In the meantime, we head out and enjoy. Regina loves hiking the most (especially when there is a swim involved). Richie loves being in the woods, but would prefer to climb on the rocks and trees and doesn't care to cover much ground. 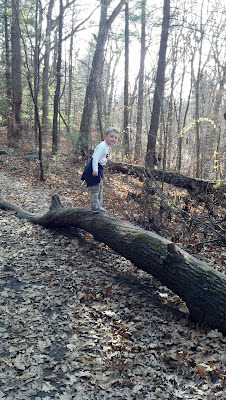 He also loves to have a treasure hunt to see how many "treasures" (rocks, sticks, leaves, etc) we can find. Angela can't decide what she prefers; to be carried by Daddy or follow her brother. She did a little bit of both today. In the last picture you can see the way Richie chose to cross the stream....there was a perfectly good bridge a few feet up, but he liked seeing me squirm! How could our buddy Riley be 8?? And how come I got a pic of Colton and not the birthday boy? Needless to say, we had a great time at his party because it had a hockey theme! And we hit Pure Hockey (and got a glimpse of Brad Marchand filming a commercial!) so now Rich has all of the remaining hockey gear. Oh boy there is a lot...ugh! I can't believe it, but hockey falls a half hour after basketball. Bye, bye Saturdays (through March!!) hello happy 4 year old! We literally had to pack a sandwich to eat as we walked from one to the other. Richie couldn't even eat his sandwich this week he was so excited for hockey (and we barely got him to leave basketball because the kids were still throwing the ball around). Richie said at bed that this was the best day ever! Since the soccer season was just way too short for Rich's liking, he has been asking when Basketball starts every day. Well it was finally here! I wasn't sure he was going to be able to sleep Friday night he was so excited. And of course he was not disappointed. Other than being the smallest fry in the Small Fry league he had a blast. A couple of Moms and one of the coaches came up to me and said how cute he was and how much heart he has about the sport. I am not sure anyone threw him the ball during the games at the end of practice, but it didn't seem to matter. We may have our next Rudy! Nothing better than a day to skip school and head to the Aquarium. We will say yes to that offer EVERY time! Angela immediately asked where Haley was once I said we were meeting Maddie. She is obsessed with that girl. We saw all of the fish, hit the playground and then finished with lunch. Boy are we sad Kara is going back to work soon. 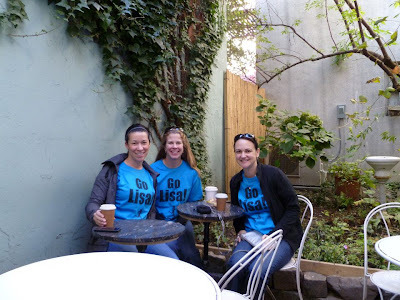 Had an amazing weekend in NYC with some of my best girlfriends to see Lisa run the NYC marathon. Not only am I RIDICULOUSLY proud of her, she made the most of her experience and was contagiously ecstatic. From the inspiring Fred's Team runners (who raised over 4.2 million dollars for Sloan Kettering Cancer Hospital!) to the quaint coffee shops in Greenpoint Brooklyn that welcomed us. From the free PBR's at the Irish Pub overlooking the race course to watching the faces of the 47,000 people who finished the race. An amazing experience from beginning to end. For some reason my kids have been continuing to make me bring out what little creativity I have. They are obsessed right now with Pirates after going to see Peter Pan and watching the Disney show Jake and The Neverland Pirates. So I somehow came up with a way to make a ship (called Bucky - from the show I think) out of a beer box. Complete with a sail and anchor. Brilliant! And the kids love it...even better! Since they don't share anything, Chris had to make one for Angela. Hers is named Buckaroo (they made that name up!). Although he loves his ship, Richie is never happy for long. Next he wanted his ship to have a "cannon shooter". So far Chris has kept him happy with the marble run down the fireplace.....that works most of the time. Luckily for me he called Babci to make him a treasure chest!! Just another fun day at the zoo and what makes it more fun is that we got to do it with good friends! Saw the baby gorilla (Kimbiri) for a long time and heard all about how she is celebrating her first birthday with a princess party. Nothing better than being outside with friends for the day. The kids get along so well with Maddie and Haley, and their little siblings (Nate and Elin) were perfect angels taking it all in. Boy do we wish Kara could stay home from work for another year! Another fun night with the Hamwey girls! We had them over for dinner and things got a little crazy (for the kids AND the adults!). In our life crazy means fun so we can't wait to have them back again.